Like a giant Meccano set, some 1500 parts are being fitted together to create a new ventilation system that will protect workers decommissioning some of Dounreay's most hazardous facilities. The network of fans, electrical infrastructure, supports, ducts, chambers and stacks will vent the airflow during the next stages of cleaning out and dismantling the key plants that made up the Fuel Cycle Area. This was the part of the site dating from the 1950s where nuclear fuels were assembled, dissolved, examined and re-assembled in support of Britain's research and development of nuclear energy. Decommissioning the Fuel Cycle Area is expected to cost �550 million and involves dismantling sealed facilities that are contaminated with some of the most hazardous radioactive debris. Some of these plants have already been cleaned out and one, the former fuel fabrication plant, has been demolished - the first plant of its type ever successfully decommissioned in Scotland. 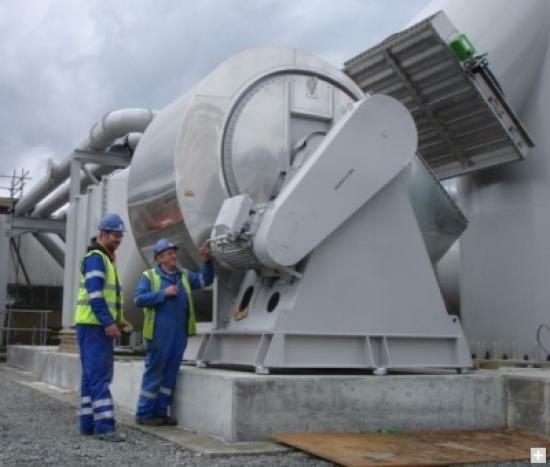 The installation of a modern ventilation system will allow teams of decommissioning staff to complete the clean-out and demolish the rest of the facilities by 2025. The steelwork, weighing some 300 tonnes in total, was delivered to the site in pre-fabricated sections in 150 lorry-loads and installation is now almost 90 per cent complete. The main contractor is JGC Engineering and Technical Services, with a team of about 40 people now working on the �9 million project. "We're on schedule to inactively commission the system by the end of October," said project manager Iain Lyall of Dounreay Site Restoration Ltd. "This will be followed by a period of testing, with a target of the end of March 2010 to complete active commissioning." Each of the dozen buildings that make up the heart of the Fuel Cycle Area has its own extract ventilation system with high integrity fans and ductwork, extracting contaminated air through high efficiency filters and exhausting into common ducts which terminate in the existing 55m high, 4.5m diameter vent stack. By next March, the existing stack will have been replaced by a new system comprising two 30m high vent stacks, each 2m in diameter, fed by duty/standby inverter-driven 90kW & 132kW fans connected to the existing common ducts. The variable duty provided by inverter control will meet the decreasing ventilation needs as the facilities are demolished sequentially over the coming years. Halifax Fans, West Yorkshire, supplied the four fans which, at 69 ins and 78 ins impeller diameters and weighing 8.5 tonnes each, were the largest nuclear specification gas-tight fans ever built by the company. The fan impeller design was based upon Halifax's Beaufort fans, with self-cleaning backward curved impellers which can be withdrawn from the drive side so that should it prove necessary, this can be achieved without the need to disconnect any ductwork. The exterior steelwork was shot blasted and painted with a high integrity offshore/chemical works 3-coat paint system with a minimum dry film thickness of 220�m. The fans were fitted with rotation sensors and vibration monitoring equipment along with gas-tight EPDM rubber flexible connections on the fan inlets and outlets and each unit was supported on anti-vibration mounts. Following fabrication, all four fans were pneumatically pressure tested in-house and witness run-tested prior to despatch to site.